Today I bring you all things cherry prompted by the super fabulous Lucinda Dress, a new product by DeathRocker Bettie Crocker that was created for the 9th Pre-Release Event which opened on Sunday. It also gave me a reason to throw on a pair of Chandra’s latest creation from her Pin-Up collection, these awesomely hot, super swank Peggy Sue Pin-Up boots from deviousMind! (to die for cute!!!) One can never have too many cherries! I adore the effortlessness of DeePosed poses. It is easy to see why Dee’s poses are used by so many photographers as they lend a smooth and gestural element to images. In this image the pose elevates the hipness of the outfit and adds a flair of fun. Boom Chicka Boom Wow Wow. Just living is not enough…one must have sunshine, freedom and a little flower. Pre-Release Session 9 opens today bringing a host of designs with an earthy feel! This floral creation by AvaGirl delicately envelopes the form with a bouquet of smexy earthen appeal! The outfit is available in 4 color palettes, each using different flower arrangements. Above is DeVine Spirit which consists of beautiful purples that are a bit brighter in most WL settings than what is shown. The adorable vines that wrap my arms are from AvaGirl’s second Pre-Release design, Flower Girl, which consists of four silks fashioned to match each of our earthy seasons. All items at Pre-Release are drastically reduced in price for two weeks and after the event they can be found at the stores regular rates at each of the designer’s outlets. So what are you waiting for…. get your earth groove on at the Pre-Release Event! Duchess laid motionless on the edge of the surf following a brutal marathon swim that ended at the land of Loki. She felt a presence but was too washed-out to care and again the world went dark. Gentle arms encircled her body and she was slowly lifted out of the water. A soothing voice entranced her and she awoke in the arms of her hero. The poses in the above story use the first set in a series of poses by elephante poses from the new Storybook Pose Collection. There will be 10 items total per chapter and the above pose, You Found Me, is part of Chapter One and is currently on sale at the Pre-Release event this round! I can’t wait to see where and how my story unfolds! Stay Tuned! I do believe my favorite part of this ultra voguish beach outfit by Mosoom is the enormous brimmed sun hat that is so beautifully textured and stylize. There doesn’t seem to be a bad angle and every movement my avatar makes while wearing it seems a bit more elegant. Coupled with Razmataz’s new model poses from the Pose Fair made for the perfect fit for the ambiance I was trying to achieve at my newly constructed deco pool! I need to find a pair of thick round black sunglasses and I will be good to go for pool season! Duchess circled the cave twice with a heavy heart and as she reached the opening she couldn’t help but turn back. Sadness crept though her like an ink spot in calm water slowly enveloping her courage. The rays of sunlight that penetrated the deep waters beckoned her upward. Ahead laid the greatest journey of her long life. 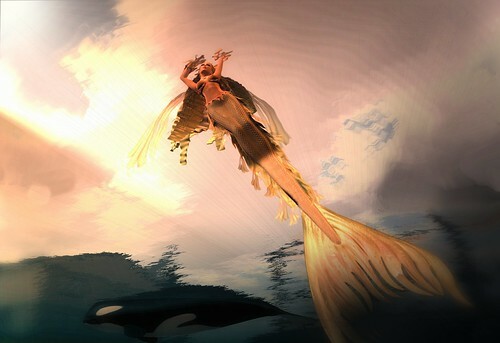 With the strength of Zeus in her fins and Aphrodite in her heart, Duchess left the safe sanctuary of her abode. Slowly she ascended from the depths of the cold dark sea following her heart upward to the oxygen filled world of the finless creatures known to those in the deep as Loki. Duchess raised her hands to the sun breaking the surf …. her fingers dripped with freedom. The poses in the above story use the first set in a series of poses by elephante poses from the new Storybook Pose Collection. There will be 10 items total per chapter and the above poses, Surfacing, are part of Chapter One and are being sold at the Pre-Release event this round! I can’t wait to see where and how my story unfolds! Stay Tuned! Gopu and I were checking out the super cool monochromatic NV Madworld sim art and I snapped some pictures as we played on the dangerous boxes and teased the black crow in the shop. Ah… now that is living on the edge! We will definitely be returning to take photos outside in the surreal landscape. Fantastic white grass, floating bubbles, drops of suspended water and dark abstract art. Swing by and check it out if you haven’t it is a great place for a photo shoot. This Pre-Release round’s theme is Designers Choice and there is a virtual smorgasbord of designs awaiting your lindens! Every item at Pre-Release is 125L or less … more bang for your buck! I adore this tied top and skirt outfit from FireBird Designs! The skull on the mesh shirt stole my little pixel heart! Smexy! I am also wearing Pre-Release jewelry from Pheobe and Pomposity. A fabulous lady bug ring and a scorpion necklace that dangerously hangs between my girls. I’m smitten! Guess who’s image adorns the cover of the Pre-Release Blog!! I can’t begin to tell you how flattered I was that my photograph was used for the banner. So many wonderful images are created by the talented Pre-Release bloggers, seriously…. tons of really beautiful Second Life photos, and little ole’ me is right there on the top of the blog swinging away! It may be silly…. but I am so thrilled… tickle me all over!